Go past the stream, Beyond the Great Maple. Look under stones and leaves, Under all that are able. "Where are you my little friend? Show your wonders to me. I want to feel the air, I want to hear and see." Search inside the trees, Search beside the water. Then you will see my friend, See what you ponder. They are the Monarchs of the Forest, Here on your shoulder. Do not move too fast, Or they will surely flutter. F a e r i e s - Faeries are very important to me. Probably more important any other creature in the world. They hold something that touches me very deeply...spirit. D i g i t a l . F a e r i e s - These faeries I created with found imagery. I do not know who's imagery, they were found all over. I do not wish to sell these or publish them in any way. 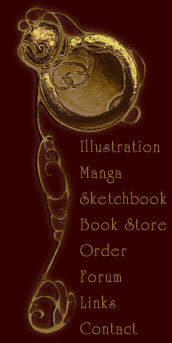 E l v e s - If its for one of my books or another, find several of my works availible to place on a bookmark! M e r m a i d s - I adore creating mermaids because I too am a water sign. It is the most vital element on Earth and one of the most beautiful. G o d d e s s e s - I have started to make some very large and rich watercolors. I call these my Goddesses. They tend to be women mostly (planning on a male here soon) who hold many strengths. They keep my world Ikara intact and protect it. O t h e r . F a n t a s y - When its not quiet the faery type or beyond average they go here. You can also find knights, dragons (soon), and wizards (soon). C o m m e r c i a l . I l l u s t r a t i o n - These are pieces of work I have done for my illustration classes at school or that I find more "commercial" than fantasy.